This bagged (and usually discount-priced) cereal from Quaker was described on the package as a "fruit-flavored corn and oat cereal with natural and artificial flavors." The cereal pieces closely resembled Froot Loops, a cereal introduced by Kellogg's in 1963. 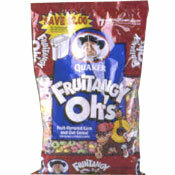 The Fruitangy Oh's package featured a monkey in sneakers and a backwards baseball cap swinging on a tire swing where the "tire" was a piece of the cereal. What do you think of Fruitangy Oh's? 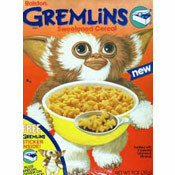 Did they stop making this cereal? I used to eat it all the time when I was in high school, to be exact, I only wanted to eat this cereal and not real food! It was so good, way better than Froot :oops, those taste like soap!